We have forgotten what it was like to count on our fingers. We have forgotten that counting itself was a mystery long before the mysteries of manipulation of numbers and the magic of mathematics. Yet the use of base-60 lies deep in our psyches. We still use it for time measurement and for geographical and spatial measurements. Attempts to use decimals for time and angle measurement have all failed miserably. Sixty still occurs in ancient Chinese and Indian calendars. Today the use of 60 still predominates for time, for navigation and geometry. But generally only for units already defined in antiquity. A base of 10 is used for units found to be necessary in more recent times. Subdivision of a second of time or a second of arc is always using the decimal system rather than by the duodecimal or the sexagesimal system. Usually the origin of sexagesimal systems of counting are traced back to the Babylonians (c. 1,800 BCE) and even to the Sumerians (c. 3,000 – 2,500 BCE). But I suspect that it goes back much further and that base-60 long precedes the Babylonians and the Sumerians. That five comes naturally from the fingers of one hand is self-evident. 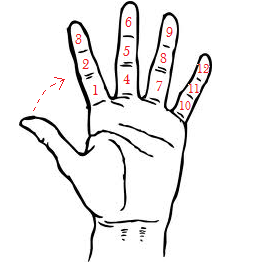 With only one free hand, a count to twelve using the thumb and the digits of the other four fingers is also self-evident. I saw my great grandmother, and my grandmother after her, regularly count to twelve using only one hand. Sixty comes naturally from a hand of five of a hand of twelve. Counting to five and twelve would have been well known to our hunter-gatherer ancestors. It seems very plausible that a hunter would look to maximise the count on a single hand. So, it is not necessary to look for the origins of base-60 in the skies or in the length of the year or the number of its divisors or the beginnings of geometry. If the origins of counting lie some 50,000 years ago, the use of twelve and then of sixty probably goes back some 20,000 years. I like 60. Equilaterals. Hexagons. Easy to divide by almost anything. Simple integers for halves, quarters, thirds, fifths, sixths, tenths, 12ths, 15ths and 30ths. 3600. 60Hz. Proportions pleasing to the eye. Recurring patterns. Harmonic. Harmony. The origins of the use of base 60 are lost in the ancient past. By the time the Sumerians used it about 2,500 years ago it was already well established and continued through the Babylonians. But the origin lies much earlier. I speculate that counting – in any form more complex than “one, two, many….” – probably goes back around 50,000 years. I have little doubt that the fingers of one hand were the first counting aids that were ever used, and that the base 10 given by two hands came to dominate. Why then would the base 60 even come into being? The answer, I think, still lies in one hand. Hunter-gatherers when required to count would prefer to use only one hand and they must – quite early on and quite often – have had the need for counting to numbers greater than five. And of course using the thumb as pointer one gets to 12 by reckoning up the 3 bones on each of the other 4 fingers. My great-grandmother used to count this way when checking the numbers of vegetables (onions, bananas, aubergines) bought by her maid at market. Counting up to 12 usually sufficed for this. When I was a little older, I remember my grandmother using both hands to check off bags of rice brought in from the fields – and of course with two hands she could get to 144. The counting of 12s most likely developed in parallel with counting in base 10 (5,10, 50, 100). The advantageous properties of 12 as a number were fortuitous rather than by intention. But certainly the advantages helped in the persistence of using 12 as a base. And so we still have a dozen (12) and a gross (12×12) and even a great gross (12x12x12) being used today. Possibly different groups of ancient man used one or other of the systems predominantly. But as groups met and mixed and warred or traded with each other the systems coalesced. And then 60 becomes inevitable. Your hand of 5, with my hand of 12, gives the 60 which also persists into the present. (There is one theory that 60 developed as 3 x 20, but I think finger counting and the 5 x 12 it leads to is far more compelling). But it is also fairly obvious that the use of 12 must be prevalent first before the 60 can appear. Though the use of 60 seconds and 60 minutes are all pervasive, it is worth noting that they can only come after each day and each night is divided into 12 hours. If we had six fingers on each hand the decimal system would never have seen the light of day. A millisecond would then be 1/ 1728th of a second. It is a good thing we don’t have 7 fingers on each hand, or – even worse – one hand with 6 fingers and one with 7. Arithmetic with a tridecimal system of base 13 does not entice me. But if I was saddled with 13 digits on my hands I would probably think differently.